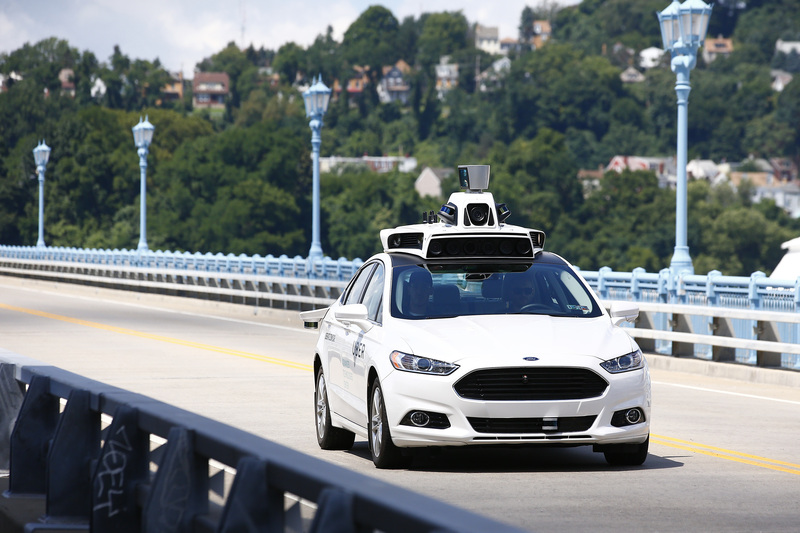 Uber employees test a self-driving Ford Fusion hybrid car on August 18, 2016, in Pittsburgh. Concerns about fuel consumption are moot if autonomous vehicles on the road are electric vehicles. A transformational change in the transportation system could have significant implications for the climate. Automation could put entirely new classes of drivers on the road. More research is needed to understand the impact that autonomous vehicles could have on transportation-sector carbon emissions. When one thinks of autonomous vehicles, or AVs, it is difficult not to imagine the world of tomorrow. It is easy to visualize safely cruising down the highway while reading for pleasure or writing a work email—rather than watching the road. Vehicle automation promises to transform how people get to work, run errands, and generally travel through the nation’s streets and highway systems. Children could commute to school alone, without relying on a parent. One can also imagine a sight-impaired person traveling alone to a doctor’s appointment. In cities, someone could hail an autonomous vehicle with a ride-sharing app and ride with other passengers going a similar direction. The idea of driverless robot cars has captured the public’s imagination as automakers and technology companies promote the potential leisure, safety, and environmental benefits of AVs. Today, automakers are already adding features to new vehicle models that assist drivers, such as parking assistance, lane centering, and automatic braking. As these features become standard in cars, automakers have set their sights on creating autonomous vehicles that do not need drivers at all. Silicon Valley and ride- and car-sharing companies are investing in technology and betting on the transportation sector’s shift toward autonomous vehicles. Autonomous vehicles—particularly those that are passenger cars—could significantly affect the country’s ability to cut greenhouse gas emissions and move toward a carbon-free economy. Existing studies suggest that three main factors will determine whether putting more AVs on the road increases or decreases tailpipe carbon emissions: effect on the total vehicle-miles traveled in the United States; impacts on congestion; and AVs’ fuel efficiency and fossil fuel consumption. As such, autonomous vehicles must be assessed not only for their safety but also for their effect on carbon emissions levels. Vehicle miles traveled, or VMT—the aggregate number of miles driven by vehicles in a given year—could increase because automation lowers the opportunity cost of driving. This could encourage people to take more car trips or accept longer commutes, since drivers would be able to multitask in vehicles rather than focusing on the road. Additionally, autonomous vehicle technology could allow groups of people currently unable to drive—such as the elderly, young, and people with disabilities—to travel alone in autonomous vehicles, putting more people on the road. VMT could decrease if autonomous vehicle technology is paired with ride- and car-sharing services. A system of shared autonomous vehicles could discourage individual car ownership and use technology to plan efficient routes to transport people from point to point. At the same time, however, shared autonomous vehicles could increase overall VMT if they make frequent passengerless trips to pick up their next client. Specialized software programs could mitigate this effect by planning the most efficient routes. Automation could reduce congestion and make each mile traveled more efficient. Autonomous vehicles that communicate with each other and their surroundings may drive more smoothly, without needing to frequently brake and accelerate. Fully autonomous and connected vehicles could reduce the number of traffic accidents and, therefore, unnecessary idling on roads. Drivers may not realize the congestion benefits of automation for years, until a large share of vehicles on the road are equipped with autonomous technology. In the shorter term, VMT and congestion could worsen as autonomous vehicles join the fleet without displacing traditional vehicles. Automakers and boosters of autonomous vehicle technology argue that autonomous vehicles have the potential to transform the U.S. transportation sector and make it more efficient. To manage this transformation, however, policymakers need more definitive research on how deployment of autonomous vehicles could affect the environment in the short- and long-term. In 2016, emissions from the transportation sector surpassed those from power plants.3 The private sector and policymakers should conduct deeper research into the emissions impact of autonomous vehicles before committing the United States to a transportation path that could lock the country into more VMT and higher levels of carbon pollution. CAP recommends several potential avenues for additional research, including the effects of automation on travel patterns and VMT; alternative fueling; driver behavior and value of driving time; traffic data collection and sharing; and the role of electric drivetrains in autonomous vehicles. While many effects of autonomous vehicle deployment remain to be seen, researchers do know for certain that emissions can be minimized by electrifying light-duty cars. As autonomous vehicles become more common on the nation’s roads, the logical way to guarantee a positive environmental impact is to combine autonomous technology with electrification. Vehicles with automation technology in levels 1 through 4 use sensors to receive information from their environment that helps the vehicle safely carry out tasks. Additionally, some vehicles have the ability to communicate with their surroundings, known as vehicle-to-infrastructure, or V2I; vehicle-to-vehicle, or V2V; and even vehicle-to-pedestrian, or V2P, technology. Collectively, these three categories are known as vehicle-to-everything, or V2X, technology, or generally as vehicle connectivity. Automation and vehicle connectivity technology represent the largest transportation sector disruption in decades. 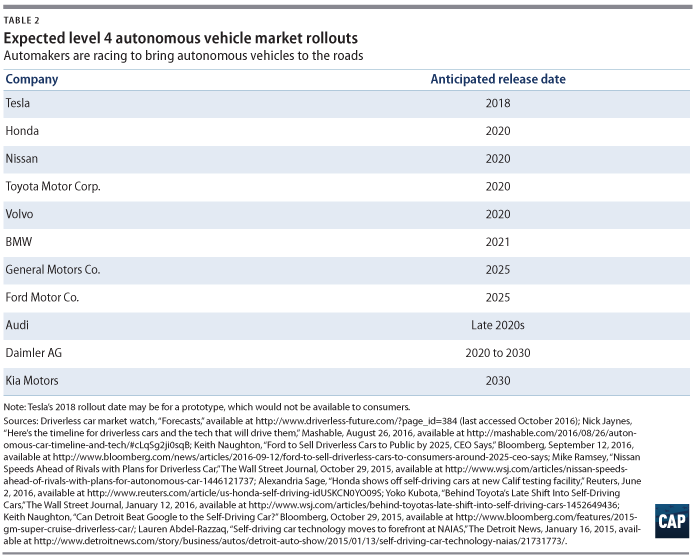 To that end, automakers are racing to create vehicles with the advanced automation and connectivity technology needed to stake a claim in the emerging driverless car market. The competition to put the first driverless cars on the road is not just among traditional automakers. Tech giants such as Google and Apple are also getting involved. Given that AVs will rely so heavily on technology—and also provide passengers with added work or leisure time—it is no surprise that tech companies would see AVs as an open market for their products. In September 2016, the DOT and NHTSA released the Federal Automated Vehicles Policy, which lays out a path for the introduction and deployment of what the DOT calls “highly automated vehicles,” or HAVs.38 Specifically addressing level 3 and 4 vehicles, the Federal Automated Vehicles Policy offers guidance on vehicle performance and safety testing and provides a framework for consistent state policies. It also discusses NHTSA’s authority to offer additional safety guidance and identifies new tools and regulatory structures that automakers and tech companies can use to put HAVs on the road.39 In addition, the department expects to release a proposed rule by the end of 2016 requiring carmakers to include vehicle connectivity technology in all new light-duty vehicles over a number of years.40 Basic vehicle-to-vehicle connectivity will help vehicles with all levels of automation communicate with one another to reduce the number of crashes and traffic jams. The United States has committed to significant carbon emissions reductions in order to avert the worst impacts of climate change. In light of these commitments, it is critical to examine the development of automation technology and self-driving vehicles through the lens of climate change. On its own, autonomous vehicle technology will not affect carbon emissions from light-duty vehicles; however, the application of the technology will herald changes in how Americans, particularly in urban areas, travel from one place to another. A transformational change in the transportation system could have significant implications for the climate. Whether AVs mitigate or worsen carbon pollution from light-duty vehicles in the transportation sector will depend on three key factors: their effect on the total vehicle-miles traveled in the United States; their impacts on congestion; and their fuel efficiency and fossil fuel consumption. In the sections that follow, the authors highlight significant studies that have examined these and other factors and identify areas of future research to fill in the gaps. The studies that this report focuses on examine how automation will affect light-duty vehicles; it does not cover research on heavy-duty vehicles, freight, aviation, and trucks. Vehicle-miles traveled is a common measure of the aggregate number of miles driven by vehicles in a given year. An increase in VMT generally leads to an increase in tailpipe emissions unless otherwise offset by improvements in vehicle efficiency and pollution control. Consequently, whether automation leads to greater travel demand or reduces VMT will help determine the climate impact of AV deployment. So far, researchers have drawn contradictory or uncertain conclusions about the aggregate effects of automation on VMT. Some experts see ride-sharing and car-sharing as a potential antidote to rising VMT from automation. Related to the issue of travel demand and VMT is traffic congestion. A car driving through heavy traffic uses more fuel and emits more pollutants than a car moving smoothly through an uncongested area over the same distance. Congestion, therefore, is more than a quality-of-life issue for drivers; it is an environmental and climate issue as well. AV technology could help reduce congestion by making driving patterns more efficient and averting crashes that cause severe traffic jams. Researchers have identified two primary ways that AV technology could help reduce congestion—and therefore vehicle emissions—in cities and on highways: by making driving patterns more efficient and by averting crashes that cause severe traffic jams. Uncertainty remains, however. The potential benefits depend in part on the level of fleetwide automation achieved and whether the vehicles are able to communicate with each other and their surrounding infrastructure.60 Moreover, AVs could cause congestion to increase in the short term before easing in the long term. As described above, RAND concluded that AVs might lead to more vehicles on the road in some areas as the opportunity cost of driving falls. This could increase congestion. RAND also found, however, that AV technology could help to avoid inefficient driving conditions, such as abrupt stops and starts common in heavy traffic. Even at higher speeds on highways, dramatic braking and other human reactions can cause congestion. Without these reactions, cars could travel close together safely. In essence, more cars could get through the same limited number of lanes more easily with automation technology, reducing congestion and streamlining the overall driving process.61 RAND also found that automation—especially at levels 3 and 4—could reduce the number of automobile accidents and, therefore, the traffic backups that often accompany them.62 As with other factors, these potential benefits depend on what portion of cars on the road are AVs. Some stakeholders warn that the congestion benefits of AVs are unlikely to occur in the short term. Researchers from the Eno Center for Transportation have found that AV technology could reduce fuel consumption in the transportation sector by smoothing out driving patterns and minimizing braking.67 This research remains speculative, as the fuel consumption benefits rely largely on the market penetration of AVs and a number of other factors. Until a large percentage of the vehicles on the road are autonomous, U.S. drivers may not realize these potential fuel savings. Until a large percentage of the vehicles on the road are autonomous, U.S. drivers may not realize these potential fuel savings. Wadud, MacKenzie, and Leiby also looked at studies on highway platooning, in which vehicles follow each other closely on the highway, thereby decreasing the air resistance for cars following the leader. They estimated that universal adoption of platooning for light-duty vehicles—an ambitious assumption—could reduce the energy intensity of vehicles 3 percent to 25 percent. If all heavy-duty trucks platooned, a feature that automated technology could facilitate, their energy intensity would drop 10 percent to 25 percent.73 It is unclear whether universal adoption of platooning is practical in real-world conditions, and these predictions are based on extrapolation of existing observations. Factors such as the saturation of AVs on the road and the ratio of heavy-duty trucks to light-duty vehicles could influence the impacts on fuel economy. Some automakers have argued that even low-level AV technology achieves some of these fuel economy and emissions benefits. As a result, these automakers have requested that the Environmental Protection Agency and Department of Transportation offer them credits against fuel economy and greenhouse gas tailpipe standards, potentially allowing more tailpipe pollution. See the text box for a discussion of these claims and why the agencies have not offered credits for AV technologies to date. Automation technology could allow automakers to build lighter and more fuel-efficient cars. If the safety benefits of fully autonomous vehicles become a reality, automakers could remove some protective bulk from personal vehicles. This anticipated safety benefit, however, likely is dependent on widespread penetration of AVs into the vehicle market. The Austin study found that right-sized fleet purchase decisions for vehicles in shared AV fleets could reduce fuel use and emissions, as many vehicles used for car-sharing would be smaller, compact passenger vehicles.91 However, the overall effect is uncertain, as smaller vehicles could limit the number of passengers in each car and increase the number of cars on the road. While researchers are beginning to examine the potential environmental impacts of autonomous vehicle deployment, more research is needed to fully understand how automation of the light-duty vehicle sector will affect carbon emissions and the climate. The Center for American Progress offers the following recommendations for additional research on vehicle-miles traveled, travel patterns, and gasoline use in AVs. Studies of environmental benefits often assume that every car is fully automated and shared and do not take into account a transition period in which humans still drive some of the vehicles on the road. A transportation system that is fully automated and dominated by car- and ride-sharing services is unlikely to occur for decades. Until that time, the number of vehicles and drivers on the road may increase along with emissions at precisely the time that the United States needs to be bending the emissions curve downward. More research is needed to study the impacts of incremental introduction of AVs to the country’s roadways; how gradual adoption of this technology might affect carbon emissions levels from the transportation sector; and how this relates to the country’s need to significantly cut emissions in the short term. More research is needed to understand how AVs will fit within the whole transportation and infrastructure system. In particular, researchers should examine the relative benefits and costs of investment in AVs compared with similar investment in public transit—another option for reducing vehicles on the road and cutting emissions from the transportation sector. Automakers and tech companies are driving the transition to a transportation system reliant on autonomous vehicles, but it is unclear whether that is the most efficient choice from an emissions-reduction perspective. Policymakers need a better understanding of how AVs and public transportation can work together to cut carbon pollution from light-duty vehicles and how policymakers should direct transportation investment in order to achieve the maximum environmental benefit. One major area of uncertainty is the total effect of AVs on VMT. The existing research shows conflicting conclusions about whether AV deployment will reduce or induce travel demand. The challenge lies in the number of assumptions that factor into whether AVs will be a net positive or detriment to the climate: whether AVs will add new classes of drivers to the road, remove cars from the road through car-sharing, encourage people to commute from farther distances, or make vehicle-based transportation more efficient. Researchers need to compile more information about how automation would affect the social cost of driving if the driver can do other things, such as work, while traveling and how that would change driver behavior and choices. Overall, researchers do not appear to have the analytical tools needed to model this complex array of assumptions and identify the range of potential outcomes. Experts should invest in new modeling capabilities to predict how these factors would interact; this would give policymakers a window into how to avoid potential pitfalls during the transition to an automated transportation system. Electrifying the autonomous vehicle fleet would alleviate concerns about new emissions from the transportation sector, assuming that the electricity sector continues to decarbonize. Policymakers and stakeholders would benefit from a deeper understanding of how the electrification of the transportation system—which must happen to achieve the nation’s climate pollution reduction goals—can proceed in tandem with the automation of vehicles. Electrification and automation of the transportation sector could require significant investment in infrastructure to support the new technologies. Further research should uncover what this infrastructure buildout would entail and how policymakers can ensure that it proceeds systematically and efficiently. Technological questions remain as well. For example, additional research may be necessary to examine how combining automation with electrification could affect vehicle performance, including battery life and driving range of EVs. Additional consumer research should shed light on how automation supports electrification and vice versa. Researchers, for example, could build on existing studies suggesting that consumers may be more accepting of electric vehicles if they are autonomous—and therefore able to fuel themselves. This could give policymakers new insight into how to design better incentives to expedite the electrification of the transportation sector. NACTO also recommends implementing a modeling exercise similar to a study performed in Lisbon, Portugal, by the International Transport Forum in 2015. The Lisbon model predicts various ways that shifts in transportation costs will influence patterns in travel. A similar modeling exercise would be very beneficial for studying the impacts of different advanced vehicle technologies in North America, which would allow policymakers to tailor policy promoting zero-carbon vehicle technology accordingly.95 This type of modeling could also help researchers compare the effects of automation on travel patterns with the effects of expanded public transit. Automakers, tech giants, and ride-sharing companies are spearheading a significant transition in the transportation sector. Companies across the spectrum are developing cars and supporting technology that will eventually allow cars to drive themselves. As this technology advances, it is critical that researchers and policymakers carefully examine the effects of these autonomous vehicles not only on safety and personal mobility but on the environment as well—particularly as they relate to the fight against climate change. While some research exists on how AVs will affect driving patterns, congestion, and accidents, further research is necessary to tease out whether AV deployment will increase or decrease vehicle carbon emissions. Under some circumstances, AVs could increase the number of miles Americans drive each year—and therefore increase emissions. In other scenarios, AVs could make driving more efficient and less polluting. All that is certain is that uncertainty remains as to whether automation of vehicles will help the United States respond to climate change. Policymakers, automakers, and tech companies need to invest in additional research to clarify the environmental and climate impacts of automation. At the same time, they should recognize that ensuring that autonomous vehicles are electric, rather than gasoline-powered, would render concerns about tailpipe emissions moot. Electric vehicles are the logical choice for a cleaner transportation future—automated or not. Myriam Alexander-Kearns is a Research Associate for the Energy Policy team at the Center for American Progress. Miranda Peterson is a Research Assistant for the Energy Policy team at the Center. Alison Cassady is the Director of Domestic Energy Policy at the Center.